I’ve been away from the blog so long that WordPress redesigned some of the behind-the-scenes bits of this business and I’ve been sitting here trying to figure out how on earth I’m supposed to bring you this delicious recipe when I can’t even figure out where I’m supposed to type the damn thing. Although I’ve only been gone a few months, evidently I’ve aged several years while I was away. Not much has been happening around here. You know, just trying to keep up with the baddest baby on the block. I won’t bore you with the details but it seems as though I might be in a position to get my act together and bring you some dinners on occasion. I’m still doing plenty of cooking, just not a lot of trying out new things. I’m making an effort to do that a bit more frequently though and plan to share some of my results with you. Yesterday, I woke up to a pile of aging, wrinkly peaches on my counter and rather than obsess over the metaphorical significance of the fruit, I decided that I needed to get on with it and make something of my life, I mean these peaches, before it was too late. 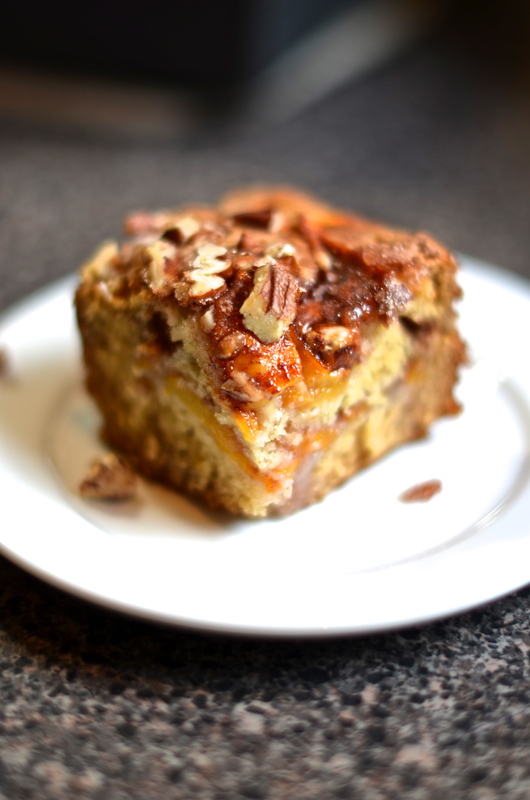 Light bulb – peach cake. I’d never made one or had one but I figured it was the right thing to do. I generally turn to a cobbler when fruit starts to pass its prime but I wanted something different. Something I could put butter on. I wanted a peach cake. First things first, let’s get prepped. Preheat your oven to 350°F and grease a 9″ square baking pan. I use Crisco. 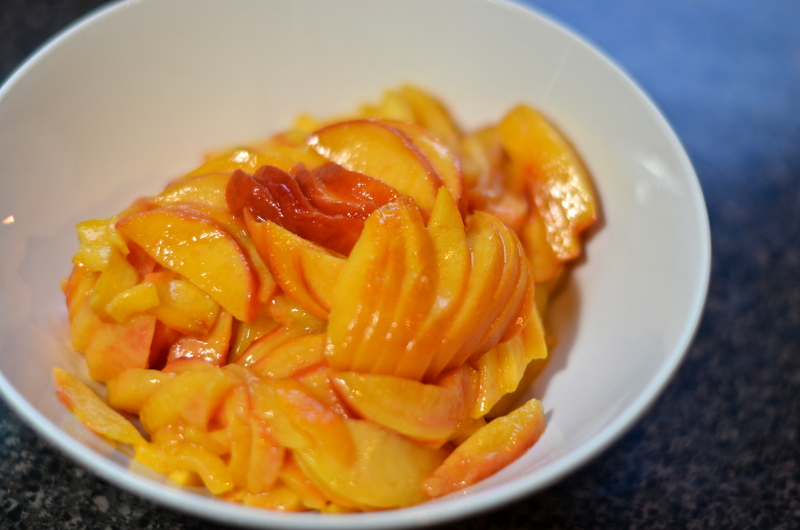 If you haven’t peeled your peaches yet, go ahead with it. 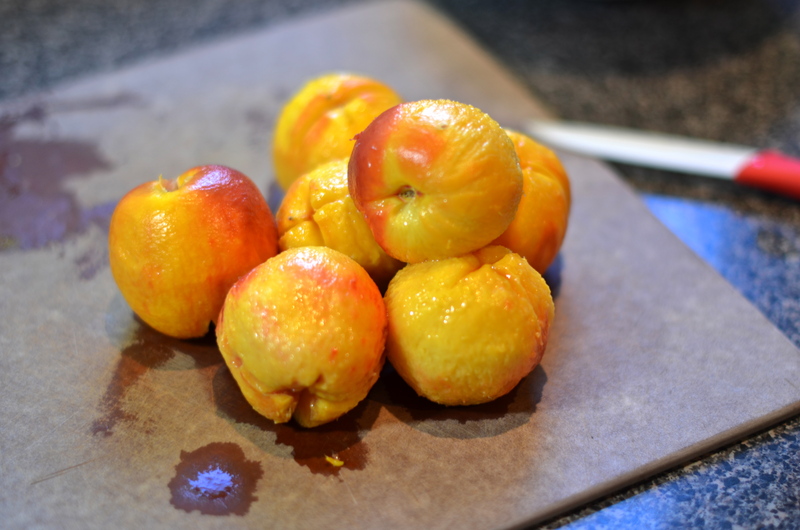 I have used the same technique to peel peaches and tomatoes forever and have mentioned it on the blog before. If you need a refresher, here’s a good video to remind you how to go about it quickly. Slice them suckers up and set aside. If your butter is soft, let’s proceed. 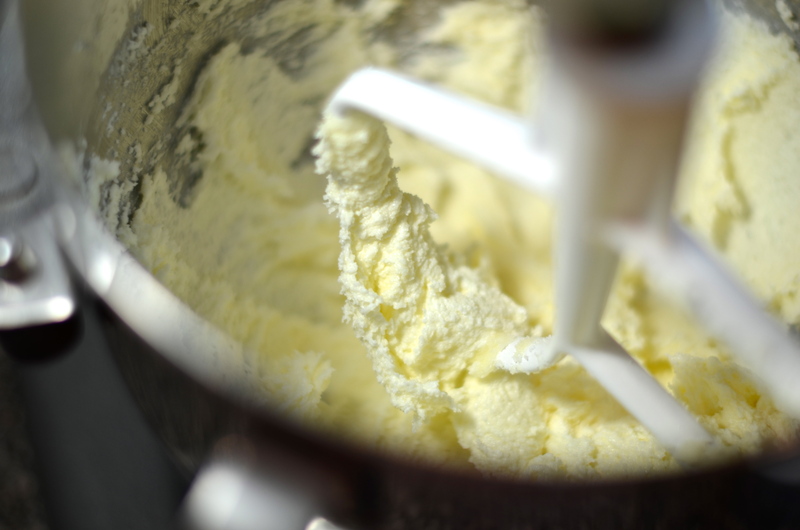 Using the paddle attachment, in the bowl of a large mixer, cream the stick of butter and 1 cup sugar until light and fluffy. 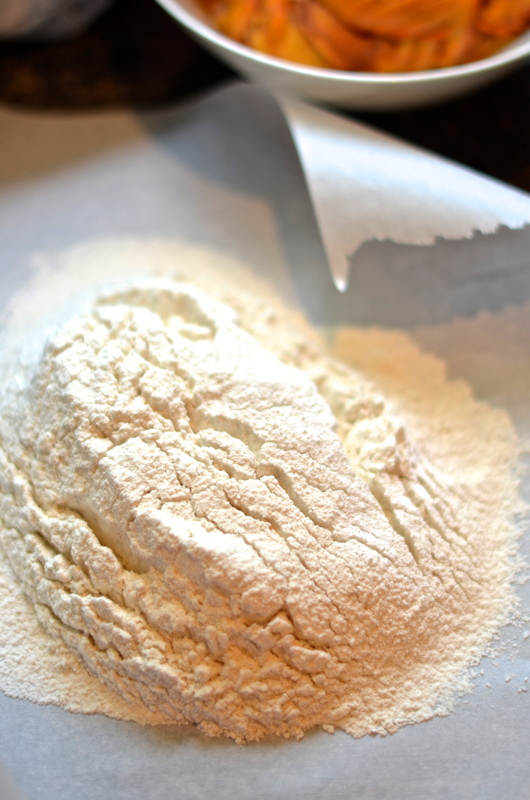 While that’s creaming for 3-5 minutes, sift together the flour, baking soda, baking powder and salt. Also, in a small bowl, combine the remaining 1/2 cup of sugar and the cinnamon. Set aside. 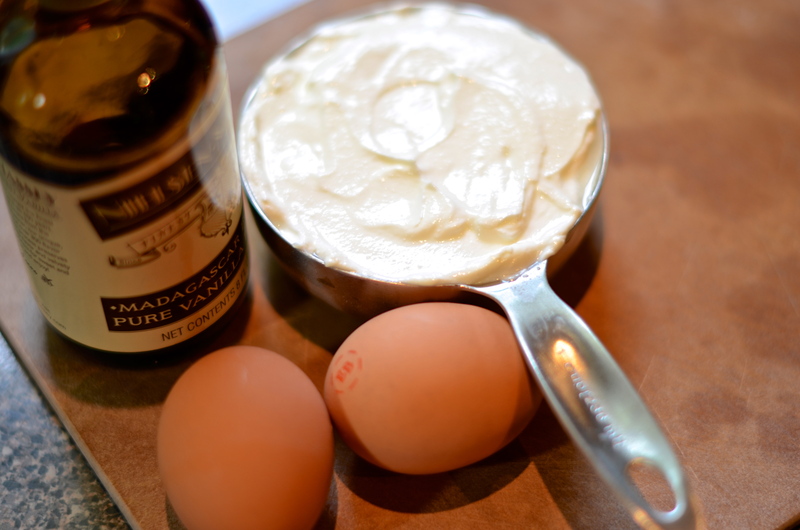 Add the eggs, one at a time, then the sour cream, vanilla and orange zest to your mixture. 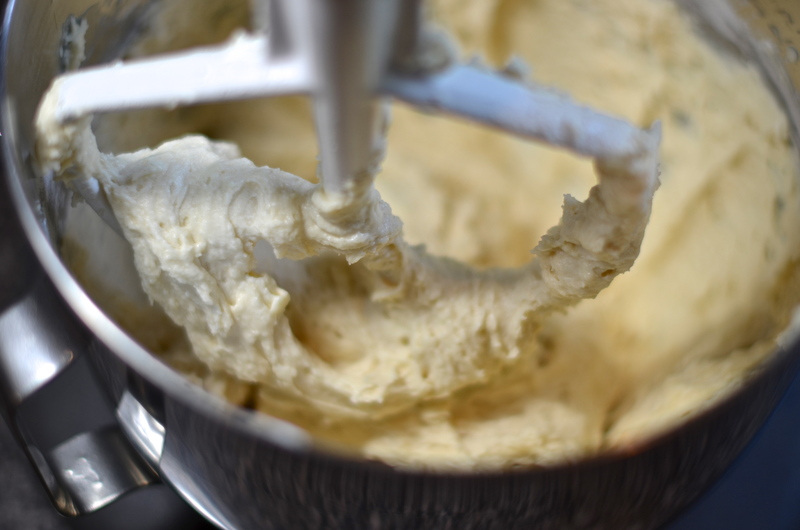 And then, turning the mixer back to low speed, add the dry ingredients and mix until everything is just blended like so. Almost done. Grab your prepped cake pan and spread half of the batter evenly over the bottom. Top with half of your sliced peaches and more than half of your cinnamon-sugar mixture. 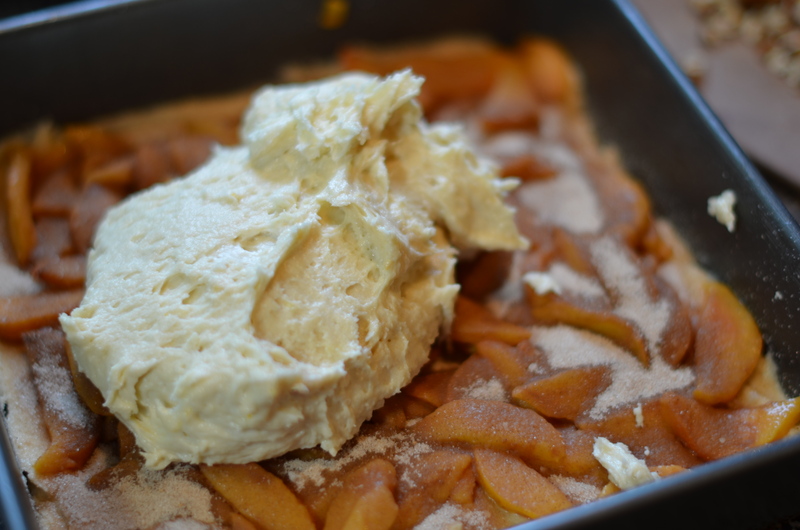 Add the rest of the batter on top of the peaches and smooth out with a spatula. 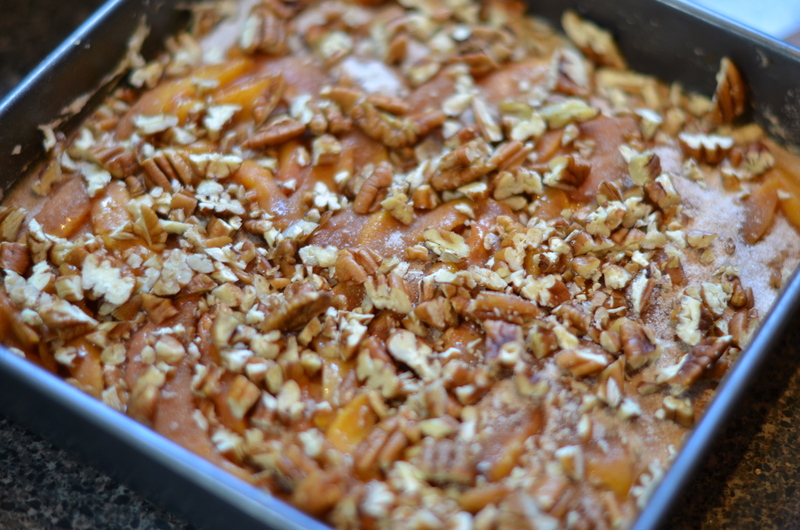 Top with the remaining peaches, cinnamon-sugar and chopped pecans. Pop that in the oven for 45 minutes to 1 hour or until a toothpick or other pointy thing comes out clean. It took me closer to an hour but I started checking at 45 minutes. 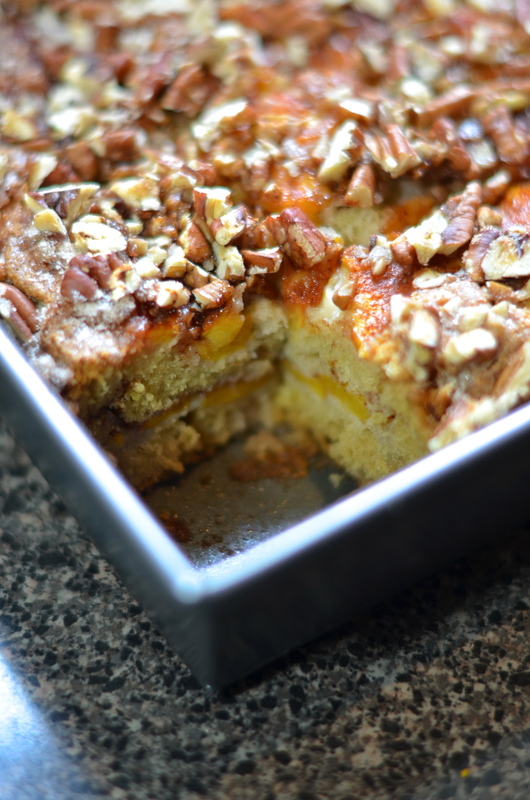 Once the cake has cooled, grab yourself a slice and feel good about the fact that none of your peaches went bad. It’s like a reward for coming to their rescue. I hope we’ll see you down here soon!